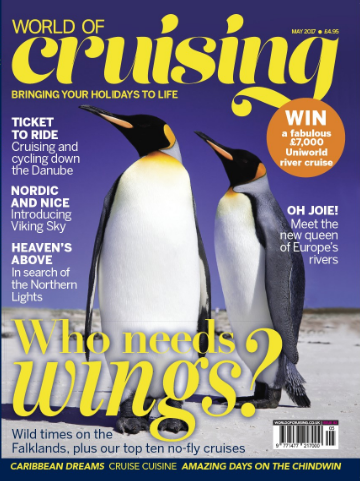 Welcome aboard your May issue of World of Cruising! A NEW ADDITION to the family is always cause for celebration. As keen cruisers will know, we’re now in the launch season, and there are some truly fabulous ships on the way. Proud owners at Viking and Uniworld are welcoming stylish Viking Sky and stunning Joie de Vivre, recently launched at a glamorous ceremony in Paris (where else?) by no less than Dame Joan Collins. See inside for full reports on both. Many more launches are scheduled over the next couple of months, and I promise we’ll bring you the lowdown on them all. As airports get busier and security tighter, the lure of the sea is stronger than ever – especially if you can just drive to the ship and hop aboard. With so many cruises now sailing from UK ports, the world really is your oyster – see page 20 for our top ten no-fly cruises. Finally, champagne corks have been popping in the WOC office too, as we toast our success in the prestigious CLIA Cruise Media Awards. Congratulations to all our writers who won awards and commendations, especially to our esteemed Editor At Large John Honeywell, who picked up the top prize. Any ship is only as good as its crew, and as captain of this one I count myself fortunate to have such a brilliant team of both writers and readers.